St Andrew’s Psalter Lane Church at 7.30 pm on Monday 17th September. 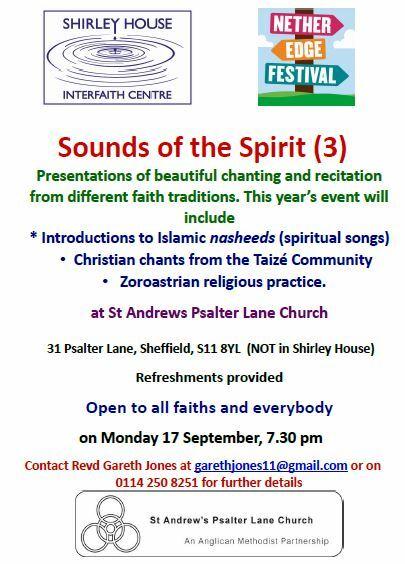 This now-annual event, organised by the Shirley House Interfaith Centre as part of the Nether Edge Festival, presents beautiful chanting and recitation from different faith traditions. This year’s event will include introductions to Islamic nasheeds (spiritual songs), Christian chants from the Taizé Community and Zoroastrian religious practice. Refreshments will be provided.